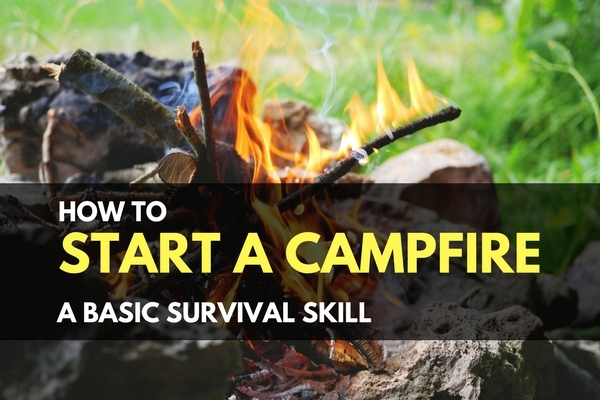 We are getting back to basics this week: very basic with how to start a campfire. Occasionally we have requests on specific topics and we try to field those requests as quickly as possible. 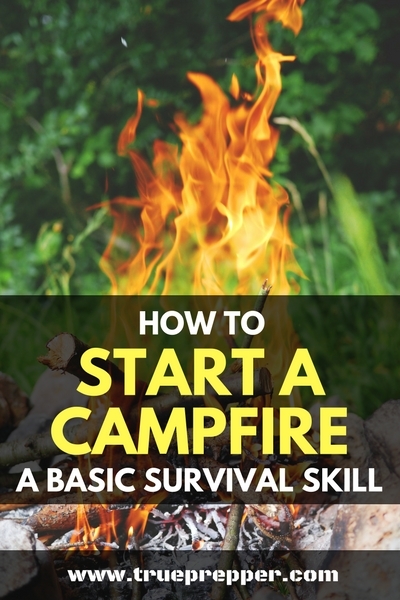 Fire starting is a basic survival skill, and preppers often have tools and supplies to assist them with the task. Whether you are using a ferro rod or a BIC lighter for the spark, feathered wood or WetFire tinder for your nest- the end goal is the same. A well constructed campfire can provide all sorts of necessities for survival. It can provide warmth in inclement weather, boil and purify water, and cook food. It can also be used to heat up tools and keep animals at bay. Lastly, it can be used for fellowship. I hope everyone reading this has made plenty of good memories around a campfire. Know the basics so you can keep making more of those memories. When selecting a spot for a campfire, try to use an existing fire ring or fire mound. You can create a ring or a mound with rocks or dirt if you need to, but be sure to check if you need a permit if you don’t own the land. Make sure your fire location is away from trees, bushes, and grass and on bare ground. Also check to make sure that you are not creating your camp under dead limbs or tree trunks- also known as ‘deadfall’. Pick a location that is isolated from possible rising water and high winds. Make sure you clear all combustible materials away from ring such as leaves, grass, limbs, and camping equipment. Be careful using river rocks for a fire ring, since the fire can heat water trapped in the rock and cause them to crack and even shoot off shards. The easiest way to get a fire going involves gathering three types of materials: tinder, kindling, and firewood. You want all pieces to be as dry as possible so they will light easily. Tinder can be leaves, wood shavings, and even dryer lint used to get the fire started. Kindling should be sticks less than an inch diameter to keep the flame going long enough for the firewood to light well. Firewood should be the larger logs that will burn for long periods of time, split if possible. Find a long stick to use as a fire poker as well. Have a container of water large enough to extinguish your fire on hand before you light the fire. Light the tinder with your lighter, matches, or other fire starting method. Slowly blow on the tinder so it lights completely and ignites the kindling and firewood, in turn. If you blow too hard on the tinder, you can put it out so experience and finesse can come in handy here. Use your fire poker to move the embers as needed. They call these three things the “fire triangle” and it’s useful for realizing where you may be going wrong. If you get rid of one of these things, the fire will extinguish, but we’ll get to that a little bit later since we are concerned about keeping it going for now. When a fire is started, there is typically plenty of oxygen and heat, but the fuel can be consumed quickly depending on the size. You will want to gather plenty of dry wood before starting a fire and replenish your supply as the fire burns. Having somebody watch and ‘tend’ to the fire is always a good idea, since if the fuel runs out- so does the fire. Sprinkle the water on the fire a little at a time to control the extinguishing. Use your fire poker to stir the fire as you go to make sure all of the ashes get saturated. If you believe the fire is completely out, check for any signs of heat, which may be buried embers. Once you have verified the fire is fully extinguished, spread the ashes around your campsite so they are spread out very thin. Try to leave your campsite as little changed as possible. Making and keeping a campfire going seems pretty easy, but bad conditions and low resources can make the task exponentially harder. Even a seasoned outdoorsman can get aggravated and forget the key basic steps to starting a campfire. If you know anyone that is terrible at starting a fire or keeping a fire lit, feel free to share with them. Keep exploring, stay prepared, and be safe.